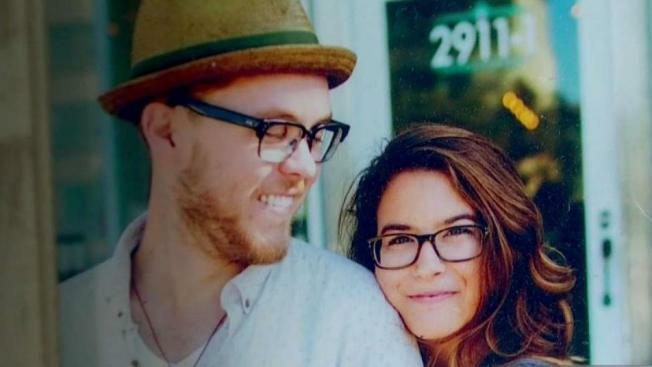 Update: After saying "goodbye" via text, Chad and Gianna Baur were reunited at the airport Wednesday night. Gianna was onboard Southwest Airlines Flight 1380 Tuesday and was unsure she'd ever see her husband again. See their emotional reunion below. A Southwest Airlines flight from New York to Dallas suffered a catastrophic engine failure Tuesday morning that apparently sent shrapnel into the aircraft, shattering a window and causing the plane to suddenly depressurize while flying above 30,000 feet. For the next 17 minutes, as the pilot diverted the aircraft to Philadelphia for an emergency landing, passengers onboard the aircraft wore oxygen masks and used in-flight texting and Wifi to reach out to loved ones in what they believed may have been their final minutes. 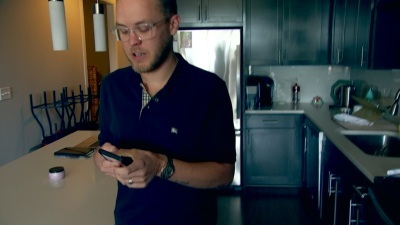 Chad Baur, in Dallas, said reading text messages from his wife while her plane's engine was failing were some of the most terrifying and intense moments of his life. Baur's phone was in his pocket when his wife Gianna started texting Tuesday morning. At first he didn't understand what she was telling him, then she sent a picture of herself wearing an oxygen mask. "That's when i started to really panic. She said a flight attendant was praying over the loudspeaker, someone else was on the emergency phone screaming for medical help when they landed." For the next few minutes, he said they both tried to tell each other everything they could in case they never spoke again. Chad Baur was texting with his wife as she rode out the final minutes of Southwest Airlines Flight 1380 Tuesday, April 17, 2018. "They announce we have to land... I'm so scared... flight attendants are checking everyone's oxygen... it's so bumpy... it's an emergency landing"
"For the next five minutes, we just try to say all the things we would want to say to each other if that was the last thing we got to say," Baur said. "Me saying goodbye to my wife, who might have minutes left, and her trying to say goodbye to me who may have decades left." During the plane's emergency landing, Baur said he didn't get any messages. Then finally he got a picture of the blown engine. He knew the plane was on the ground. Airport staff look at a destroyed engine on Southwest Airlines flight 1380 in Philadelphia. "I don't think I cried or even had an emotion until after she said she landed. That's when I kind of just lost it." Baur said his wife of just three years practically never pays to get in-flight messaging. He's not sure why she chose to do so today but he said the experience has forever changed him. "It's not every day, or every year, or every decade that something happens that makes you stop and just be grateful for life and the people you got to live it with, and this was that moment for myself and my family." Though Gianna Baur escaped without injury, there were casualties. A woman sitting next to a window was nearly sucked out of the airplane after her window was shattered. Passengers were able to pull her back in, but she was not able to overcome her injuries and she died at a Philadelphia-area hospital. Baur's father-in-law, Todd Baur, spoke with NBC 5 Tuesday morning and shared Gianna's story and that she saw a woman drawn out of the plane only to be pulled back inside the cabin by quick-thinking passengers. Gianna, who grew up in the San Francisco Bay Area, flew back home Wednesday. "It is pretty terrifying, but (I'm) doing okay," she said. "My sister-in-law is flying with me, thankfully." Philadelphia firefighters said a dozen other passengers were evaluated, though only seven needed treatment and none required hospitalization. The cause of the engine failure is being investigated by the NTSB with the full cooperation of Dallas-based Southwest Airlines.